Germany v Brazil was a typical friendly match for the home side and a serious test for the away side that wanted to overcome the horrors sustained at the 2014 FIFA World Cup. As a result, the Seleção was the more competitive of the two teams despite Germany dominating much of the game. Germany finally lose a match. Gabriel Jesus with the game-winning goal. It was an apprehensive start to the game with the Seleção, in particular, sitting deep playing reactive football. Perhaps it was the memories of Germany’s 7-1 victory over Brazil at the 2014 FIFA World Cup, but the respect by the team in yellow and blue was tangible. Germany, in the meantime, started the game as the more confident team and tried to pressure the Seleção into making individual mistakes. 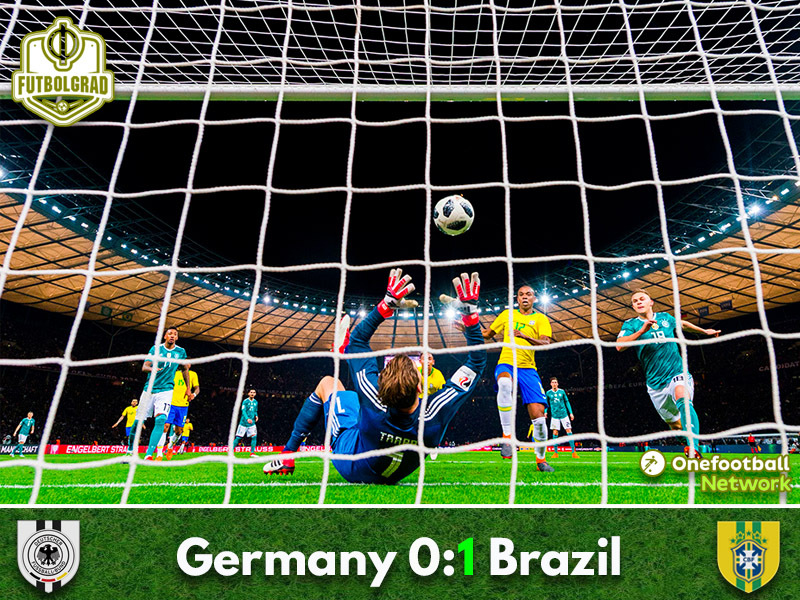 Only after about ten minutes did Brazil start to put pressure on Germany making it hard for Die Mannschaft to play the ball out of the back in a controlled fashion. Nonetheless, it was Germany with the first great chance of the game in the 16th minute. Leon Goretzka won the ball in Germany’s half and found Leroy Sané on the left-wing, and the Manchester City winger made a great run forward finding his City teammate Ilkay Gündogan free in the box, the central midfielder mishit the ball over the crossbar, however. From that moment onwards Germany had more from the match with plenty of space on both wings Sané and Goretzka were able to feed centre-forward Mario Gomez, who could not capitalise from the crosses provided in the 22nd minute and the 30th minute both times a Brazilian defender was able to interfere just enough to keep the scoreline even. In the 35th minute Brazil, finally, had their first big chance of the game. With Germany pressing deep in Brazil’s half Gabriel Jesus found the room to counter and went one-on-one against Germany keeper Kevin Trapp, but both Antonio Rüdiger and Jérôme Boateng had rushed back to interfere enough with the forward to prevent the goal – replays later showed that Gabriel Jesus was offside. In the 37th minute, Brazil took the lead after Willian’s cross found Gabriel Jesus in the box his header went straight towards Trapp, who fumbled the ball allowing the ball to cross the line. The first 45 minutes ended with Germany dominating large parts of the game, but Brazil had the lead thanks to a goalkeeping mistake by Trapp. Again it was an apprehensive start by both sides. This time it was the Germans, who had the more careful start. Die Mannschaft sat deep forcing Brazil to play further up the pitch. As a result, Brazil had the first chance of the second half with Willian winning the ball at the edge of the box in the 52nd minute and then playing the ball on the right where Gabriel Jesus played a dummy giving Paulinho a double chance, but his first shot was blocked by Boateng, and the rebound was stopped by Trapp. In the 57th minute, Philippe Coutinho had the next chance for the Seleção his shot from 18-yards, however, just about missed Trapp’s goal. The goal seemed to have woken up Germany a bit as die Mannschaft was now a bit better involved in the game. But at the same time, Brazil appeared the more dangerous side as Germany’s chemistry was not helped by a wave of changes made by Bundestrainer Joachim Löw, who made four changes in the first 25 minutes of the second half, while Brazil’s head coach Tite left his starting eleven intact for much of the match. In the 75th minute Germany, finally, had their first chance of the second half. Kimmich brought in a cross from the right half-field finding Sandro Wagner in the box his header, however, was wide of Alisson’s goal. At that point, Germany had 55% ball possession but die Mannschaft struggled to get the ball behind Brazil’s defensive line. Hence, while Germany was having the majority of the play die Mannschaft lacked real goalscoring chances until the 91st minute when Julian Draxler hammered the ball from 25-yards on Brazil’s goal forcing Alisson to make his only stop of the match. In the end, the Seleção got the result that they wanted by defeating Germany 1-0 after what was a test match for the home team and a path towards healing wounds for the away team. Gabriel Jesus was the man of the match. The Manchester City forward was the only forward, threatening Germany’s backline and then scored what would be the game-winning goal in the first half. The forward has now scored nine goals in 15 games for the Seleção highlighting that he can replace Neymar should the Brazilian fail to gain match fitness ahead of the 2018 FIFA World Cup in Russia. After going undefeated for 22 games, Germany finally lose a match. Die Mannschaft controlled large parts of the game against Brazil but could not break down a deep sitting defensive line. The result is a disappointment for Germany given that this Brazilian side, although much improved Tite, remains very much beatable. Germany, however, lacked the creativity to break down a static defensive line with Leroy Sané, in particular, lacking the decision making. The game somewhat improved for the Germans when Sandro Wagner and Lars Stindl came on and only really started to become dangerous in the final ten minutes with Leipzig’s Timo Werner on the pitch, who will have now nailed down his starting position in Germany’s squad this summer. Previously unbeaten in 22 matches, Germany fail to go even with the national team’s previous record which was set by Bundestrainer Jupp Derwall between October 1978 and December 1980. Germany lose for the first time since the semi-final at the 2016 European Championships in France. Brazil have just lost one game under Tite. Their record in 18 games under the head coach is W14 D3 L1.